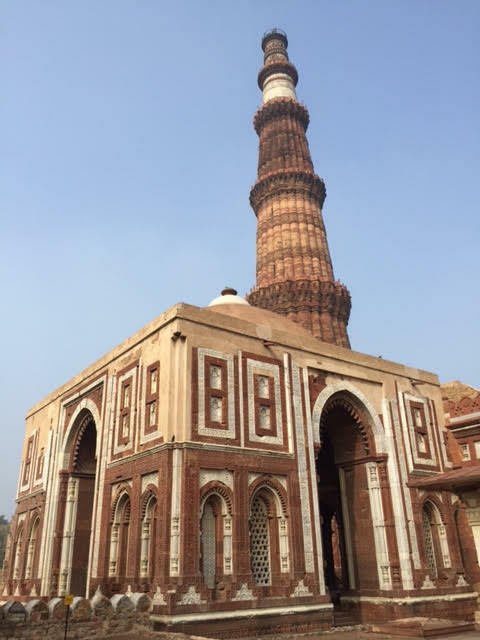 What I did on my excellent India vacation—Part 5. 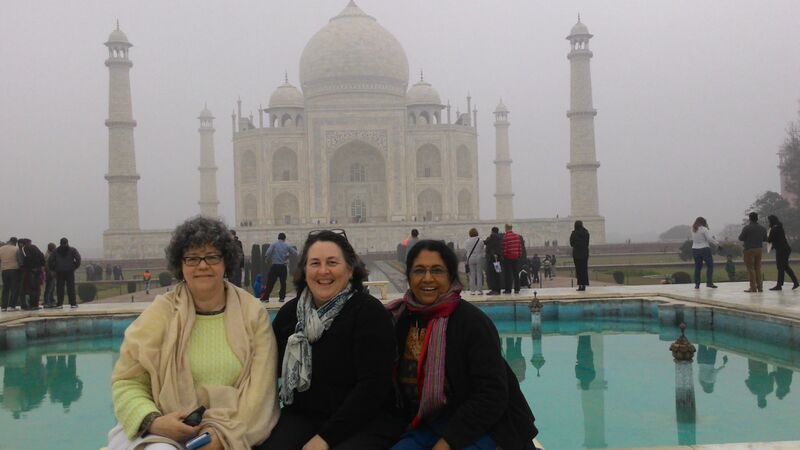 [NOTE: I’ve been traveling in India with (brave or perhaps stupid) friends Janine and Jaya for several weeks. My apologies in advance for any delays in responding or posting. 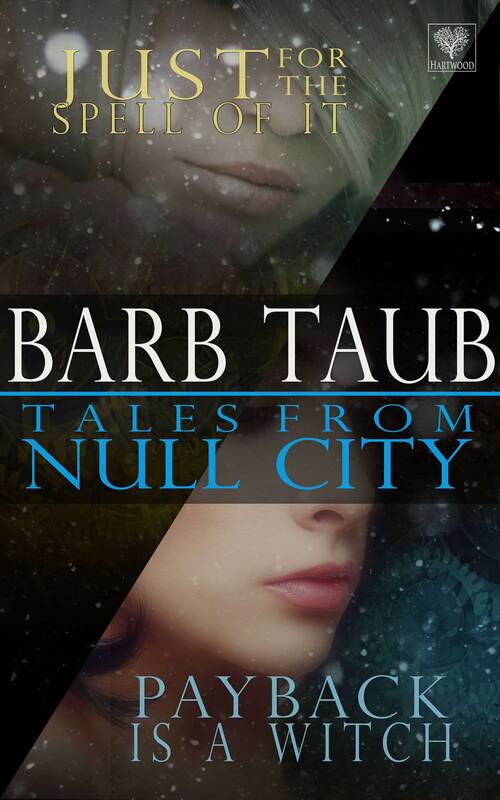 I’ll be adding updates about our adventures as quickly as I can get to places with internet connections. Until this trip, my tastebuds led a sheltered life. 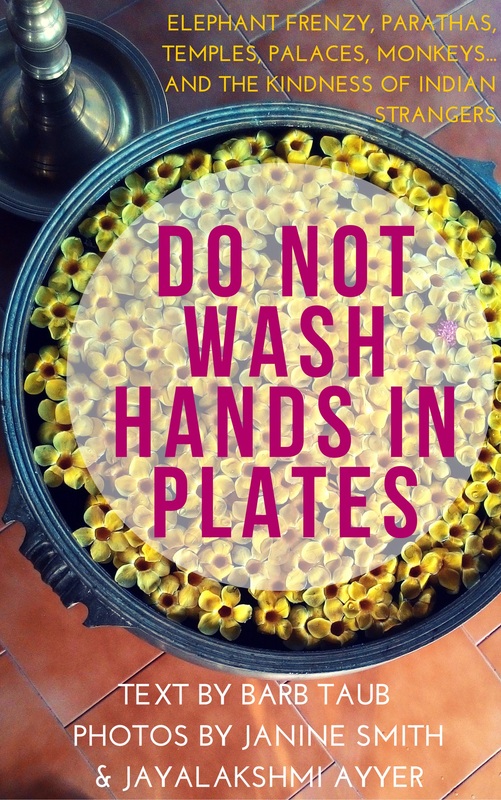 That all changed at our guesthouse in Delhi, when the cooks set a beautiful omelet in front of me. My American self admired the veggies, including the chopped green peppers that added so much color. One bite later, and my tastebuds went from innocent bystanders to drive-by victims of green chili omelet assault. My friends, whose mouths must have been lined with asbestos, tried to ignore me as I poured my yoghurt (okay, and theirs too) down my abused throat, tears streaming down my face. 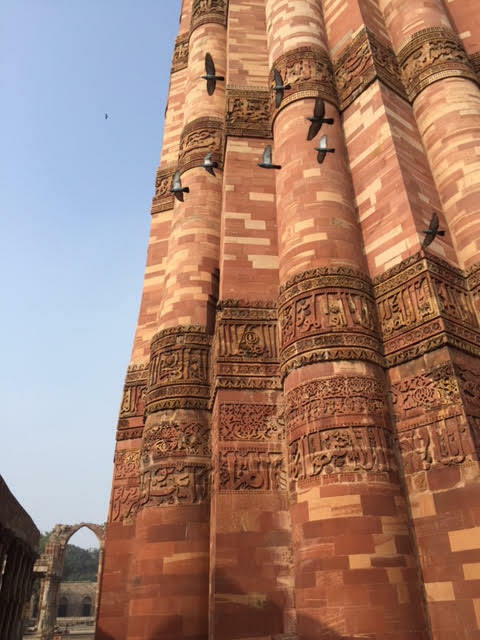 When I could talk without gasping, we headed out to visit Qutab Minar, the 73-meter (240-foot) tall tower built by former slave Qutb ud din Aibak, the first Muslim Sultan of Delhi. 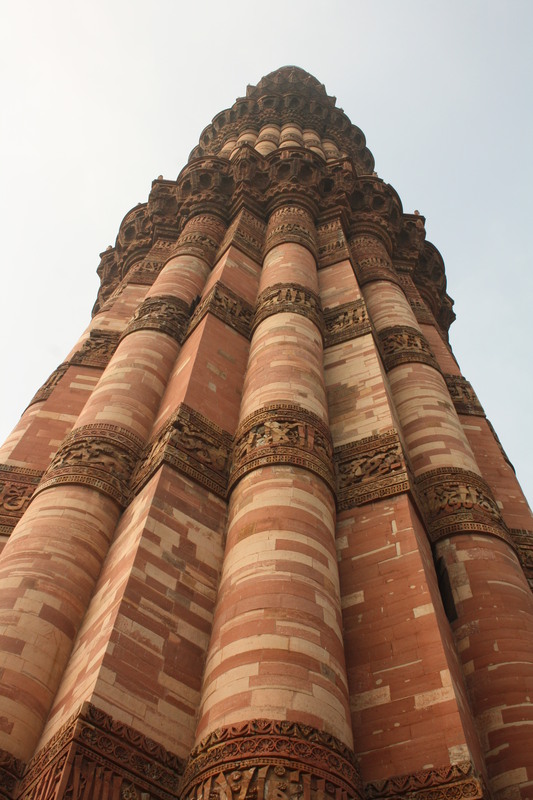 Building started in 1193 to mark the defeat of Delhi’s last Hindu kingdom and was completed a brisk 175 years later with the addition of the fifth and final level. Standing behind the incredibly beautiful Alai Darwaza gate, the complex also includes Quwwat-ul-Islam, the first mosque built in India after the Islamic conquest of Delhi. 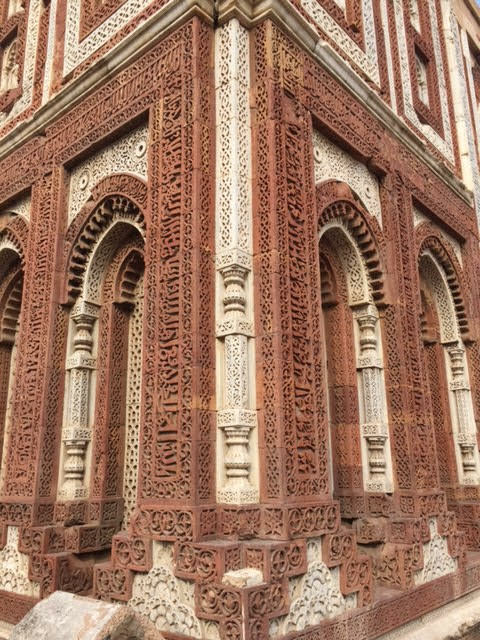 Interestingly enough, the mosque incorporates ancient carvings and pillars from twenty-seven destroyed Hindi and Jain temples. The 1600+ year old iron pillar that doesn’t rust. The courtyard also contains the mysterious iron pillar. 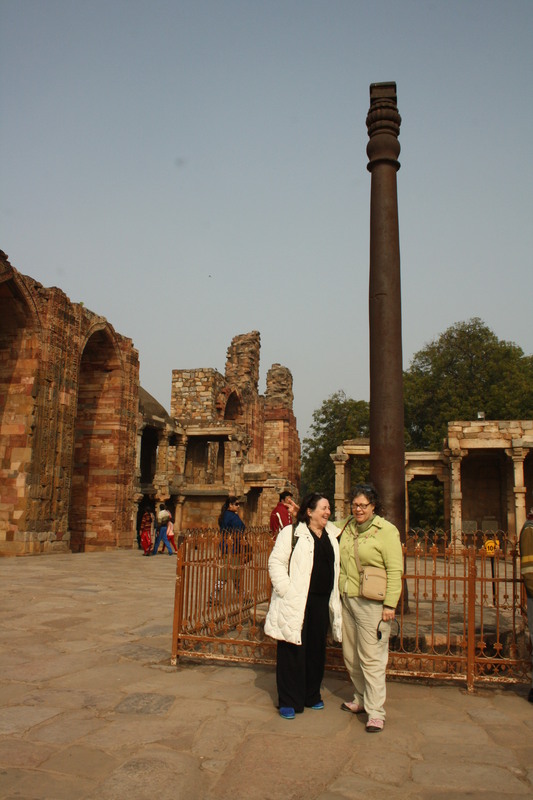 Jaya said that when she was a child, visitors would stand with their backs against the column and attempt to wrap their arms behind the structure. If their fingertips met, it would signify luck, or long life. Unfortunately, the pillar is now fenced off so our own longevity remains a mystery. But the real mystery that has baffled scientists is how an iron pillar erected in the fourth century AD could have withstood corrosion to remain standing today. When we stopped for lunch, I had to admit that my sore throat could no longer be blamed on the breakfast fire-omelet, since it had now invited a fever and chills to the party. That was my first (though, sadly not nearly my last) introduction to the wonders of prescription meds, Indian style. It never occurred to me when I decided to travel with a chemistry PhD and a cardiology nurse-practitioner, that it would be the perfect storm of people who love prescription drugs meeting people who love to sell them really cheap. 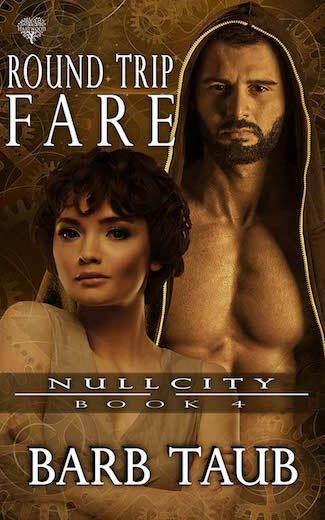 The two of them conferred with the pharmacist, chortling in delight at the over-the-counter low cost and availability of things that would require a hospital stay, very good insurance, and a compliant physician back home. While I obediently popped Rx handfuls like they were medicated M&Ms and headed back to bed, Janine and Jaya headed out for the Eighth Wonder of the World. 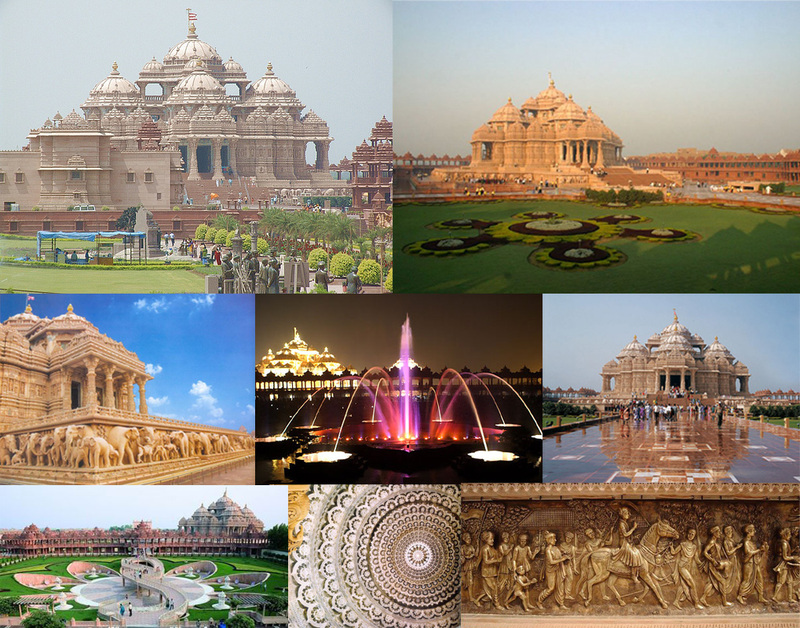 At least, that’s what people are calling Delhi’s Swaminarayan Akshardham, the Disneyland of temples which boasts, among other records, the Guinness World Record for being “the world’s largest comprehensive Hindu temple”. We don’t have any pictures, because—in a stroke of absolute organizational genius—cameras and phones are not allowed inside. That’s the only possible way they could actually move 25,000 people per day through the Happiest Temple Place On Earth. Swaminarayan’s history is told along exposition halls with animatronic tour of his life plus an Imax movie of his youth and the movement he founded. There’s also an amusement park style boat ride showing the history of India from prehistoric through current times, illustrated by tableaux of animated figures. Janine and Jaya were particularly impressed with the Musical Fountain, a water and light show (laser projections, music, coordinated with patterned fountain displays) based on the moral message of the Upanishads (Hindu scriptures). 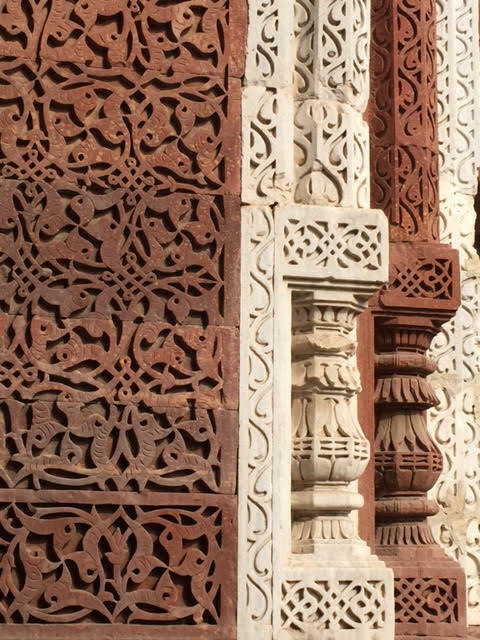 Following the show, they went into the temple—an incredible feat of engineering and craftsmanship made entirely of stone, with carvings and artwork. Of course, the real marvel was the efficiency with which temple staff moved about ten thousand people through with no hangups or delays (probably because they would not allow cameras or cellphones or food or even water inside—until you get to their 5000-seat food court, that is…). 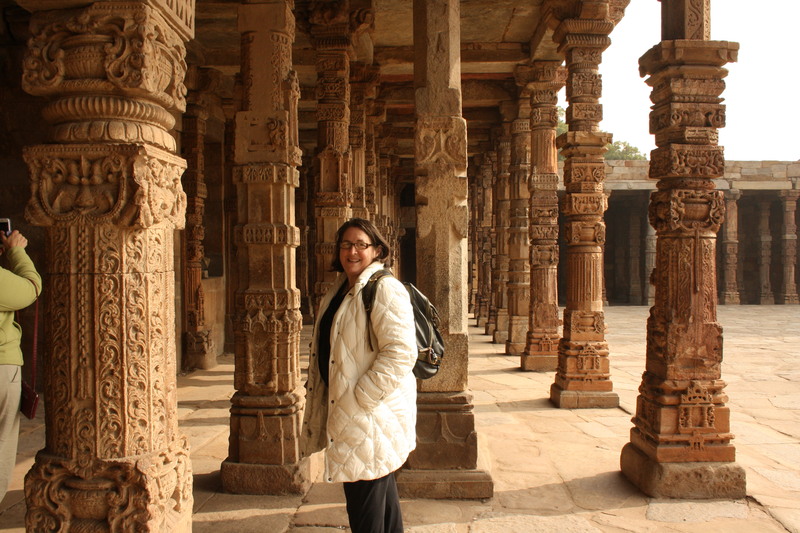 Loved reading about your India vacation adventure. Great pics and updates. What a trip! Thanks! I think about you at some of the restaurants—you’d love this place! Loving the pictures. So much beauty and history. It’s right up your alley! Fabulous photos..and the musical water fountain looks amazing. I’m so upset that I missed that one. Just hearing about it was amazing. I have a very good Indian friend and I’m used to some of the cooking, although unfortunately I haven’t visited yet. It sounds like an amazing adventure. I’ll have to come back and catch up on the rest.